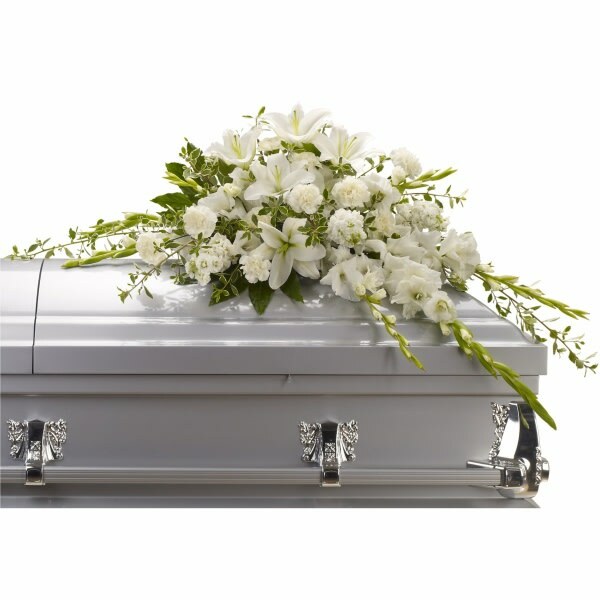 A casket spray made of all white flowers and simple greenery is a simply stunning way to honor the deceased while bringing a quiet strength and serenity to those present. 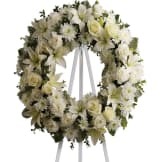 • Gorgeous white oriental lilies, gladioli, carnations and more create a beautiful crescent shaped casket spray. 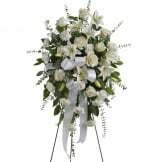 • This arrangement measures approximately 49" W X 27" H.
Flowers will be received by a Spurgeon Funeral Home's staff. 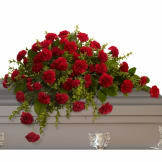 I was unable to attend the funeral but my parents said the flowers were lovely and delivered on time. I appreciate the convenience of ordering them as I live across the country. 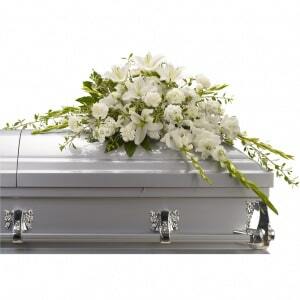 All of our flowers are designed and delivered by hand from a local florist in in Brownstown.